J&N Feed and Seed is your source for Rio Gameloads! Rio Game Load shot shells present an affordable choice for game and target shooting and we’ve got a great selection right here in Graham, Texas! Whether you’re looking for 12 gauge, 20 gauge or something different, we’ve got what you need this hunting season. Rio Game Loads combine state of the art components and over 100 years of technical know-how to produce the perfect load for upland hunting applications. From the diminutive 2 1/2″ .410 to the hard hitting 3″ 12 gauge turkey load, Rio’s lead game line combines consistency and reliability in every shell, to bring unparalleled performance to the field. 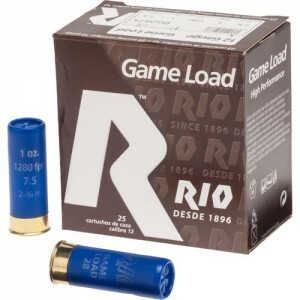 12 Gauge Game Loads come in a wide range of choices – 1oz. to 1 3/4 oz payloads of game-stopping lead, in shot sizes 4, 5, 6, 7 1/2, 8 and 9. Rio game loads combine the company’s own high quality, proprietary components and a century of ammunition manufacturing expertise for a lethal combination of modern technology and old world experience. Pick up your Rio Gameloads and all your hunting supplies at J&N Feed and Seed.